In concert with the EFORT mission of restoring and securing mobility, musculoskeletal health and quality of life on behalf of the European Orthopaedic and Traumatology community, the EFORT Education Committee is supporting high quality research projects in Orthopaedics and Traumatology. Collaboration with National as well as Specialty Societies and other partners shall be strengthened in order to fulfill the intention of improved research in Orthopaedics and Traumatology. An important tool is the approval of third party projects which support this intention appropriately. The following steps have to be completed during the application process, to guarantee approval and endorsement of high quality research activities. The project information should be provided to EFORT via the following Submission Form. Forms must be received at least three months before the project is launched or submitted to funding agencies. EFORT will then review the information and the applicant will receive a reply within a period of one month after submitting the form. 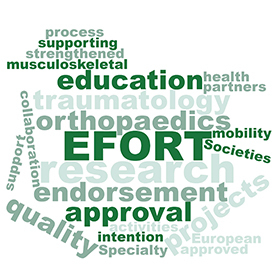 A positive evaluation will generate an EFORT letter of support, expressing the interest that the project has for the European R+D landscape in Orthopaedics and Traumatology. The endorsed projects that are successful may be eligible to produce a summary to be disseminated through EFORT networks (OTE, EFORT web page, etc). PROJECT CHARACTER National and International high quality research projects with European scope. At least the title, the full summary of the project, and the list of investigators (by name, by institution and by country) are required. When requested, investigators CV and/or full research proposal may be required if the committee needs supplementary information. The funding agency and the call for projects where the letter will be applied are mandatory. INVESTIGATORS The PI should be based in a European recognized institution or university hospital, and the project should include investigators from several European countries. EVALUATION The outcome of funding agency evaluation, when performed with support of EFORT, should be transmitted, to be listed in the EFORT web page if successful and to be eligible in a future request of another letter of project support, if required. DECLARATION OF INTEREST Short outline of applicants interest in obtaining EFORT approval, and future interest to disseminate results through EFORT. REQUESTED FUNDS Indication of full funding to be requested for the project. The main language of the project document must be ENGLISH. The Project is to be developed, in whole or significantly, in European countries. Ethical principles application within the Project should be confirmed. Please fill the following form to apply for an EFORT endorsement of third party research project. Please note that mandatory fields are marked with an *. Please provide your first name and last name. Please provide the name of the Institution along with the street address. Not in this current form, but previous intents. Submitted to a different Funding Agency. Is your project supported by industry?